Backache from cutting up fabric, not so fun! But I muddle on determined to ignore the pain and continue on with my busy life. 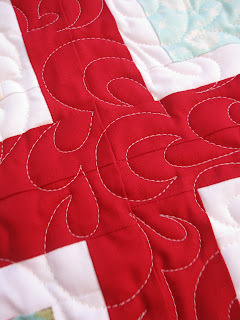 I am participating in the Sliced Coins Quilt Along hosted by Elizabeth D. of Don't Call Me Betsy. I decided to go outside of my creative and rather comfortable box and use solids in order make a decorative quilt for the end of my bed. I am using Kona Champagne, Basil, Curry, Honey and Butterscotch. Having a Kona card has been such a big help as I was able to sit on my bed and match Kona colors to the colors around my room. I look forward to the outcome. I also started cutting into the Sunkissed by Sweetwater fabric that I received last week to make the first block in the Block-a-pallooza. I wish the directions could be a little more clear on what fabrics we should or could use. I ordered the entire Fat Eighth as recommended and don't know if I want to use exactly the same combinations that the block host designers illustrate in the directions. I guess I'll just have to wait and see. 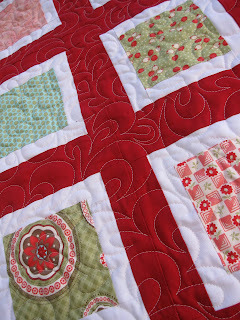 Last week my quilt using the That Girl Quilt Along came back from the long arm quilter. I am still blown away with what a great job she did with the quilting. I shared with you all before that I had such a tough time myself when I tried to quilt it so sending it out seemed the right choice, and boy was I right. I was right, don't you think? I just love how Maria from Nena's Quilt Shack did her magic on my quilt. I'm working on the binding at night and should have that done within the next few days. I'm back in school this week working on my Teaching Credential. TB test, Fingerprint Scan, sign up for the CBEST test are just a few of the tasks I need to complete this week. I was warned that the first class of the teaching credential was the paper-pushing class and they weren't kidding. My other class is ECON 300 - Econ for non-majors and as usual I was the oldest person in the classroom of 100. In the introduction class yesterday the teacher kept talking about some kind of disgusting frozen pizza (sorry - admitted food snob here) to illustrate the labor supply, so I substituted that example with a quilt. Made me smile and worked very well. Go check out Lee from Freshly Pieced to see what other creative people are working on this week! Ick! Hate TB tests! The QAL quilt looks great! Thanks for sharing! 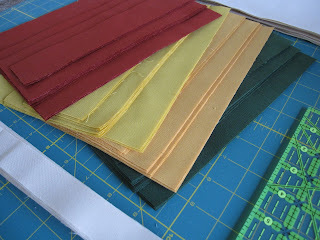 Oh, I will be excited to see your Sliced Coins quilt in the solids! They look delish. And your That Girl quilt in Bliss is AMAZING! I love it. Oh very fun, a solids Sliced Coins quilt! Your That girl quilt along quilt is amazing! Such a great job that quilter did. Good luck with your school work. 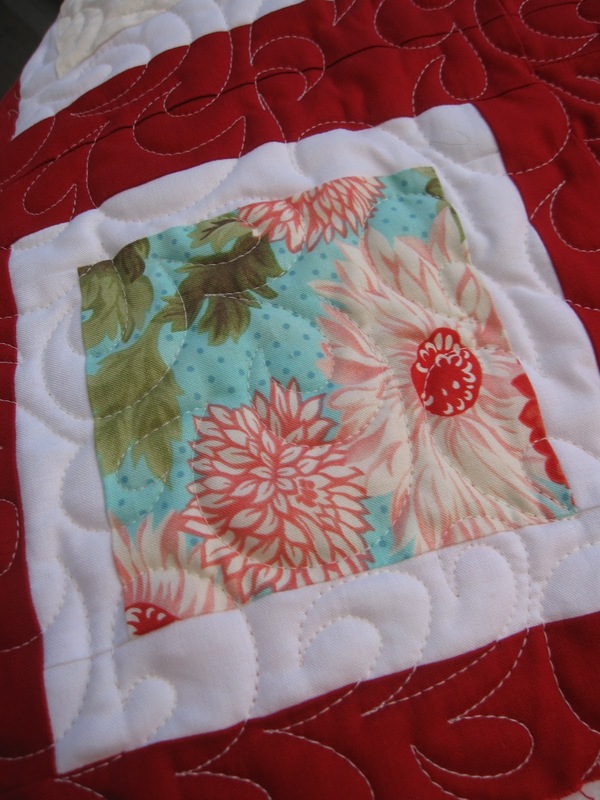 Oh wow, the quilting on your That Girl quilt is just gorgeous! The white stitching against hte red is incredible. 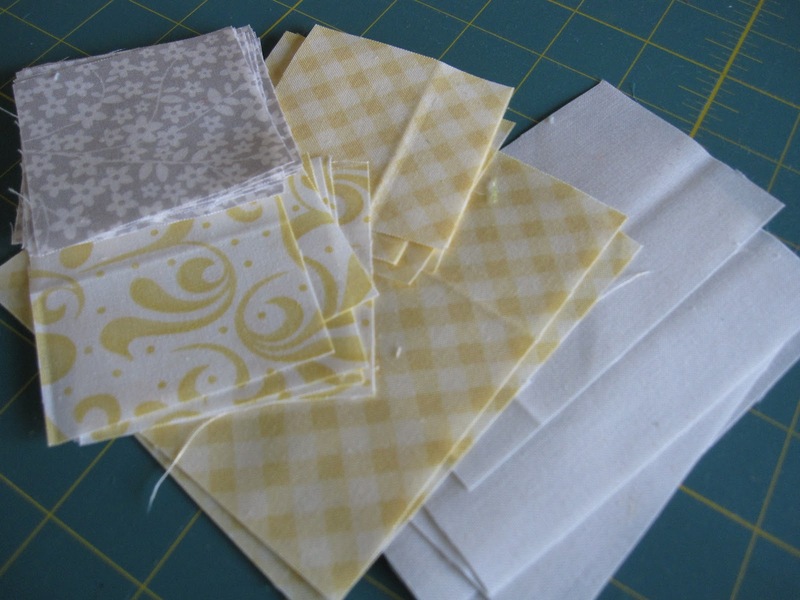 I'm excited to see your sliced coins quilt out of solids! Great colors. 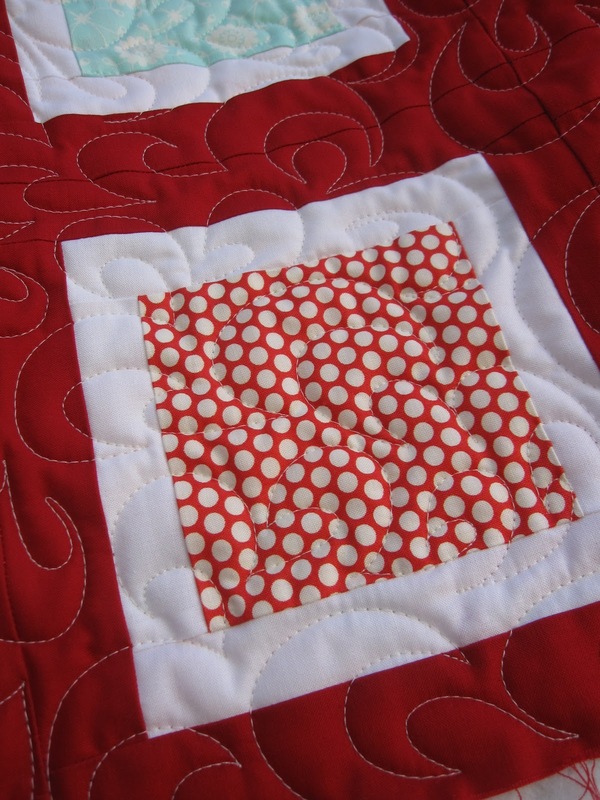 And the quilting on your That Girl quilt looks fantastic! I love your bold choices for the sliced coins quilt! It's good to get out of your comfort zone sometimes. I need to do that more often too. Your That Girl quilt is beautiful! Where to begin! I really like all your WIPs! The Bliss looks awesome with that red. Your sliced coins is going to be very striking I think.